Downtown America was once the vibrant urban center romanticized in the Petula Clark song—a place where the lights were brighter, where people went to spend their money and forget their worries. But in the second half of the twentieth century, "downtown" became a shadow of its former self, succumbing to economic competition and commercial decline. And the death of Main Streets across the country came to be seen as sadly inexorable, like the passing of an aged loved one. 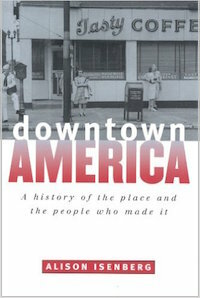 Downtown America cuts beneath the archetypal story of downtown's rise and fall and offers a dynamic new story of urban development in the United States. Moving beyond conventional narratives, Alison Isenberg shows that downtown's trajectory was not dictated by inevitable free market forces or natural life-and-death cycles. Instead, it was the product of human actors—the contested creation of retailers, developers, government leaders, architects, and planners, as well as political activists, consumers, civic clubs, real estate appraisers, even postcard artists. Throughout the twentieth century, conflicts over downtown's mundane conditions—what it should look like and who should walk its streets—pointed to fundamental disagreements over American values. Isenberg reveals how the innovative efforts of these participants infused Main Street with its resonant symbolism, while still accounting for pervasive uncertainty and fears of decline. Readers of this work will find anything but a story of inevitability. Even some of the downtown's darkest moments—the Great Depression's collapse in land values, the rioting and looting of the 1960s, or abandonment and vacancy during the 1970s—illuminate how core cultural values have animated and intertwined with economic investment to reinvent the physical form and social experiences of urban commerce. Downtown America—its empty stores, revitalized marketplaces, and romanticized past—will never look quite the same again. A book that does away with our most clichéd approaches to urban studies, Downtown America will appeal to readers interested in the history of the United States and the mythology surrounding its most cherished institutions.